Black and white negative of a studio portrait of the Ellins family. The family is dressed in formal attire. 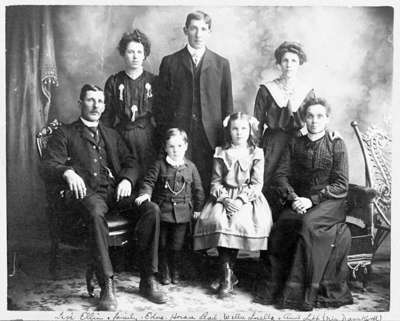 Back row: Edna Ellins, Horace Ellins, Pearl Ellins. Front row: Levi Ellins, William Ellins, Luella Ellins, Mary Elizabeth Ellins (nee Nancekivell). Levi Ellins and Mary Elizabeth Nancekivell (1862-1953) were married in 1881 and had five children. They resided at Columbus. Levi Ellins Family, c.1905, Stedham & O'Brien. Whitby Archives 19-049-001.